Undertale created by Toby Fox. 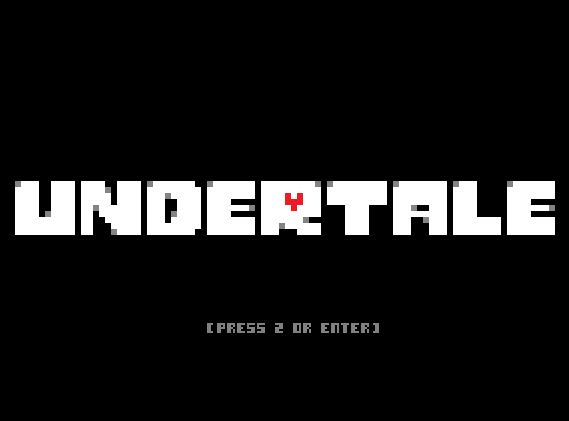 Created almost exclusively by one programmer, Undertale is an indie game of epic proportion. Drawing inspiration from RPGs of all stripes (though EarthBound should immediately jump to mind), it is the story of a tiny adventurer who has become lost in a land of monsters. They must find their way out... but whether they will carve a bloody path to freedom, or find a friendlier way back to the daylight, is up to you. Undertale is a game of choices and consequences. Expect to play it more than once, and don't expect each play-through to be the same. Thanks very much! I've found many interesting. What about the "secret" room in snowdin with the 4 glowing mushrooms..? The one where you go to the left, Sans is there... twice... and when you talk to the second sans to the left, he says "are you following me?" What's the answer to that puzzle? It says in the Easter Eggs. But essentially, you have to not turn a single name yellow in the pacifist credits, meaning you have to avoid all of them. you must complete the true pacifist route and... in the credits... y o u w I l l r u n a w a y f r o m t h e credits.... which is fun! It unlocks if you dodge all of the names during the special thanks section of the credits for the pacifist ending. i don't know if somebody will read this but i really love this game, i cried a lot! I love so much the history and the characters, but my favorite chara was asgore, when i played the game for the first time i cried like a baby when i had to kill him because i wanted to do the pasific route but it isn´t work in the first time that you play. i was super scared because that i thought that i made something wrong before, after that i read the truth and i was like ARGGGGG because i was so sad because i killed him. im confused about the name, i made it frisk the first time i played, and then i reset a while later and was ableto change the name. now when i reset i cant change the name anymore. can anyone explain this? I just wanna point out that Frisk is canonically non-binary and Frisk's pronoun is "they", and not "heshe". That was really weird to read. The game itself calls Frisk by "they". Can we use that here, too? Thanks. For that you have to date Papyrus, make friends with Undyne, and THEN will you receive Undyne's Letter. Date Alphys, then go to her lab. True Lab is there in the elevator. Under tail walk through for the right and magnificent. Floating devices of the resume are composed and intensified the fundamentals for all themes and for all offered. Motions are included and injected. Undertale is a fantastic and interesting game I have played all seven parts of this game and all parts is awesome. Such type of posts are helps to paid essay writers or those people who don’t know about this game but I am also expert and I don’t need any gaudiness. Under tail of the walk through for the right and necessary terms. The introduction of the pay to write essay walk is here for the wonderful and for all vital trends. Look here if you want to improve your essay writing skills.